Unfortunately, it’s not that simple; there’s no guaranteed solution for creating the world’s best webinar, and unlike within the world of free novelty t-shirts, one size does not fit all. However, you can make things a bit easier by implementing industry best practices, taking advice from seasoned industry experts (that’s us) and putting the hard work in. While there’s no pre-webinar checklist to promising the generation of leads, sales or success, there are certainly things you can do to increase the likelihood of closing more business, hosting a better webinar, and just generally being more awesome. Keep reading and you’ll find them out - this is our very own take on the webinar checklist. We’ve spoken a lot about this before, but we’ll say it again because it’s so important: you need to choose a relevant topic that has real worth. You need to start by identifying exactly why you want to host a webinar, what it’s going to aim to cover - for example, does it tackle an industry pain point? - and then set clear goals for what you hope to gain from it. Consult and liaise with other departments. Say your webinar is coinciding with a new sales pitch, or you’re demonstrating a full product launch, then your sales department would be the perfect team to work with in deciding not only on your goals, but your plan of action. Once you know why you’re hosting your webinar, consider who you’re hosting it for. Is your target audience at the top or bottom of the sales funnel? Are you targeting new leads or communicating with previous clients? These will help with the initial planning process. What kind of webinar works the best with not only your chosen subject, but your goals? Once you’ve identified - for example, whether you’re holding a Q&A or thought leadership webinar - you can shape the first outline of your plan around it. You can also consider whether to bring in co-hosts or other tools and begin to make bigger decisions. This decision will be influenced by the requirements of your webinar; for example, video, audio, and visual tools. Will you require your attendees to have access to resources? Will you need to implement polls or other additional content? If so, you need to make sure your provider can facilitate this. A lot of webcasting platforms promise a whole lot of versatility and then never deliver. 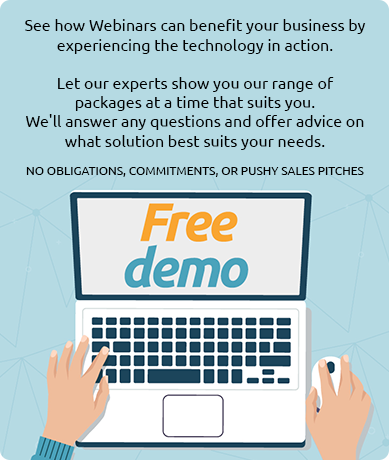 It’s one of the key reasons we always say to ask for a free trial before subscribing to any webinar software - then you can see for yourself what you have access to. Our FastCast system is one of the most versatile on the market if you’re looking to use additional resources that’ll make your webinar more interactive and engaging. Plus, we offer free trials and one-off solutions instead of subscription-only services. Just sayin’. Once you’ve got the bones of your webinar, you can begin the proper planning process. This is where things get quite exciting - you’ll be able to start researching your topic thoroughly and making those big decisions. It’s also the time you can begin the writing process. And we don’t just mean the webinar script here; it’s an important time to start ensuring all of your website and social content is up to date, as well as being well-written and relevant to your potential leads. If your webinar manages to hook some new clients and get them to the top of the sales funnel, you don’t want to lose them by offering out of date or low quality content later. That said, a script is important - us humans aren’t built for thinking on our feet and only some are blessed with the skills to pull it off. Most of us just go off on tangents, look a bit silly, and your audience won’t thank you for it. After the planning stage is complete, and you know what you want to say - and have a clear CTA to accompany your content - it’s about finding the best and most compelling way to say it concisely. Remember, ensure that your topic is fully and thoroughly researched. Know what you’re talking about so that you can offer new, fresh ideas and content. That’s how you’ll sell your ideas, your product, or even yourself to potential B2B clients. And do so nice and early. The whole process we’re talking about here should be over the duration of several weeks or even months worth of work. Of course, last minute webinars are possible, but speed should never take priority over quality work and good content. Set up a registration page to begin to garner interest early on - once you’ve set a definite topic, CTA, platform and date. Promote via social media, using platforms like LinkedIn and Twitter to reach out to wider communities within your industry and hopefully generate new leads. Remember, even if you get more sign-ups than actual attendees, these are real people with a genuine interest in your topic that you can reach out to later. So ensure all of your promotional content and registration copy is engaging, compelling, and perfect for drawing interest in you and your company. We can’t stress this enough. Start practicing as soon as possible, even if there’s plenty of time to go until your actual webinar. Run through the script, test the compatibility of your script with your platform and ensure that all of your resources work in concordance with your plan. Keep working with the members of your team, rehash content that doesn’t work, and make sure that your CTA is running clearly throughout everything to incentivise your attendees. Webinars are hefty pieces of long-form content that are time-consuming and costly to make. If you’re not putting your all into ensuring their production is second-to-none and the content as high quality as possible, then your wasting your resources. Your webinar is around the corner, after weeks of work. It’s time to be getting excited, but also to be tying up any loose ends, epitomising your quality checks and adding the final touches. Ensure that everything is prepared; your script checked and practiced, your webcasting platform fully trialled and compatible with any external resources. Check your visuals, including branding and design. If you’ve got a chatbox or hashtag planned for engaging with attendees whilst live, make sure these are prepared and functioning as planned. Check your downloadable resources are working and that all of your tools are well integrated. Make sure you have live support from your provider in case there should be any technical difficulties. Not to humble brag (again), but our name is a literal one - with FastCast, you have support from us 24/7. Do a proper soundcheck, using all of your tools, resources, visuals, videos, and ensure that your co-hosts are prepared. Check your equipment, make sure that your microphone and audio are working - have a colleague join the webinar and feedback to you if there are any problems. Check your surroundings for any background noise or possible interruptions and ensure these won’t pose a problem. If you’re well prepared, this part will hopefully be a breeze. Though we can all experience inevitable technical difficulties sometimes, your audience will understand that you’re live and sometimes these things do happen, as long as these are genuine and not just an example of a lack of preparation. Have your webinar provider at the ready should there be any problems, and don’t let your nerves get you down. Whether this is your first webinar or your 100th, it’s totally natural to get an attack of goosebumps - just don’t let it distract from the task at hand. Nope - or at least, not if you want to make the most of all the work that you’ve just done. Well done by the way - we bet your webinar was a smash. Anyway, now it’s onto step two. It’s time to start measuring all of those analytics and that juicy data you collected during the webinar; this will help you measure the success of the webinar itself, which can then be translated into future marketing and sales strategies. Next, follow-up. Start a discussion, incentivise the no-shows to go in and watch the webinar - you’ll be pleased to know with a system like ours, their analytics will also be collected. Finally, repurpose. Put all of that work and research into fragments of fresh new content for your website, social channels or blog. We go into all of these in more detail in our blog What to Do When Your Webinar Finishes, which is well worth a read. After all, you’ve put all of that work in - make sure you get everything you possibly can out of it! We hope our guide has helped a few of you - whether you needed reminding to tie up those loose ends, or if your poor, content-marketing brain is just a bit frazzled from all of the planning and needed a reminder. We’ve got more tips and tricks dotted around our Knowledge Bank for you, but if you have any other questions, get in touch any time!